Let your little boy make a stylish statement with the Uhud boy’s jubba in a rich navy-blue colour palette. To determine the size required for the child, please measure them from the shoulder (trapezius) to the ankle. Please note our age recommendation shall only be used as a guideline. Let your little boy make a stylish statement with the Uhud boy’s jubba in a rich navy-blue colour palette. Making a feature of the classic tassel detail, detach for a simpler look or wear, hanging to the waist for a classic finish. Complete with soft gold edging and handmade buttons, the jubba is cut with a tapered fit for the perfect silhouette. A stylish blend of golds and cream create the Taha kid’s thobe, the perfect choice for dressing your kids in traditional attire with a modern twist. Crafted in a soft and breathable cotton and polyester blend fabric, the Oraif boy’s thobe teams pure white with a combination of red and blue contrast stitching for a classic look. 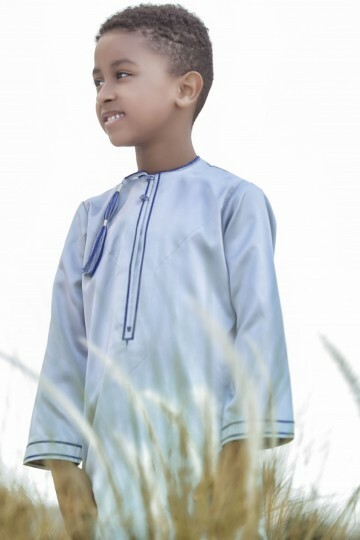 Dress your little one in a stylish boy’s thobe, perfect for a formal or traditional event, with the Ahqaf kids jubba, crafted in a luxe cotton and polyester blend. About Faris products, services and events.